Local elections will be held on Thursday 2 May 2019. One seat in each of the Council's 26 wards will be up for election. Ensure that you are registered to vote by 12 April 2019. 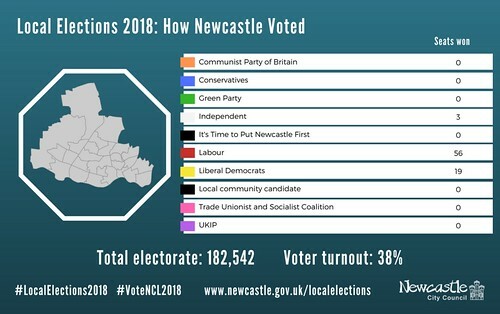 Find out how Newcastle voted in the Local Elections 2018. View the results for each ward including voter turnout using the carousel slideshow below. View the current political composition of the council. You can find your local polling station here or use the map below. Electoral Services, Newcastle City Council, Civic Centre, Newcastle upon Tyne, NE1 8QH.